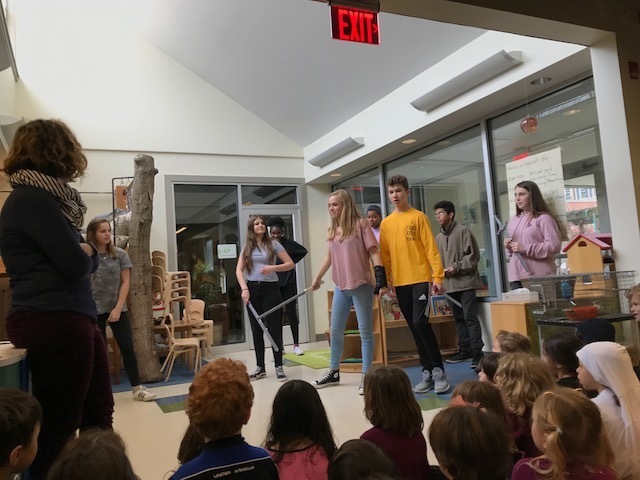 While the rest of the school enjoyed the eighth grade Shakespeare Festival this week, the preschool teachers opted for more developmentally appropriate “sneak peeks” of a few rehearsal moments. This afternoon we were treated to a visit by some of the students who’ve been performing Romeo and Juliet. They demonstrated their inspired acting and some of the stage combat techniques they had recently learned from preschool teacher Jonah. How lucky we are that our oldest students are mentors and inspirations for our youngest learners!